The free investment calculator aims to help you decide whether you should invest on a project, an art work, or anything you intend to buy now and sell in the future to make a profit. 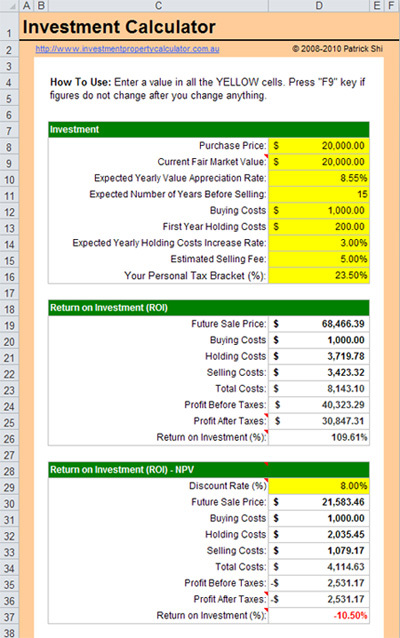 This investment calculator allows you to specify the purchase price, value appreciation rate, buying, holding, selling costs, tax bracket etc variables so that you can estimate the return on investment on both face vaule and net present value of the investment. Here is a screen shot that will give you a better idea that what you need to do and what the free investment calculator can calculate for you. Download FREE Investment Calculator Now!